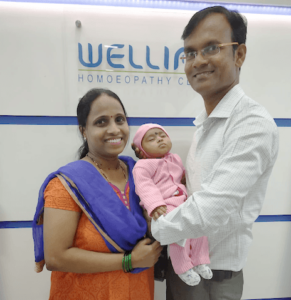 The only speciality Homeopathic Infertility Clinic for alternative to IVF treatment for the last 10 years. Enquiry Consultation for Rs.450 Rs.1000 for limited time. Concieve Naturally in 2019. Homeopathy Assisted Reproduction Therapy ( HART ) is an alternative for IVF treatment, specially developed at Welling Clinics, to cure the root cause in men and women, helping you conceive naturally. Developed after exhaustive research and study, the treatment has helped over 2000 couples to conceive naturally. It is safe, painless and completely side-effects free. What exactly is this infertility treatment? How long will it take for me to concieve naturally? Each cycle of the treatment protocol includes 6 months of medications and consultation to target and cure the root cause. It has helped upto 90% of couples within 3 cycles of our treatment. Why only Welling Homoepathy for my fertility treatment? If you would like to talk to someone from Welling, before visiting us, feel free to call NOW. You could be the next happy family, without IVF treatment ! How can IVF cost become cheaper and affordable for all? Get answer to this and many more such questions, when u meet directly with our specalists. Seriously! How long are you going to struggle for a child? Before any treatment, first step is meeting our specialists for a detailed assessment. Call 8080 850950 to book an appointment. Disclaimer: The treatment has helped more than 2000 couples from over 100 countries in the last 16 years. But as the treatment outcome may vary from person to person, we suggest you to meet our specialist today to know if the treatment can help you too to conceive naturally.